BFH gives you a complete instructional package for all ages. The manual is your reference. It has all the essential information to learn and teach the BFH method. The CD-ROM has additional help and lessons to print out for students. 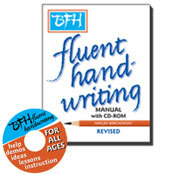 BFH Fluent Handwriting Manual without the CD is available as hard copy or as a downloadable version. HOW TO USE THIS PROGRAM is a brief explanation of the program. POSTURE, PEN HOLD & PAPER POSITION addresses in detail all that is in the title, including comfortable seating with good lighting, and positions for right and left-handers. EXERCISE PATTERNS, RELATEDLETTERS & PRACTICE WORDS Please see the sample page with its full explanations. JOINING LETTERS presents joins in the order of ease with which most people can write them.. Here you see part of join three and four. 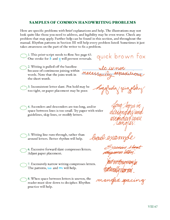 MISSTEPS & MYTHS addresses all of the most common handwriting problems that are real or perceived, and offers solutions. 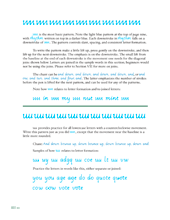 The sample page shows some problems that affect legibility and/or speed. III: click the image for a preview. VII: click the image for a preview. VIII: click the image for a preview. A CD-ROM for Windows only accompanies each manual. It has four sections, GETTING STARTED, INDEX, CONCEPT and MY PAGES. GETTING STARTED has five parts, most with sub-categories. FINDING YOUR WAY is a detailed description to help users get the greatest benefit from the program. Wow! This seven-year-old has excellent pencil hold and paper position! Warmup exercises get the rhythm going before students begin to write letters, words and sentences. Handwriting is a physical activity. Just as one warms up before a baseball game or music recital, one should warm up with simple letter-related exercises. FOR OLDER STUDENTS has suggestions for help. These too are illustrated with short movies that feature both right and left-handers. Here is the text for a movie in this section. The left-hander has his paper to his left, and tilted so he can see his writing. He pulls downstrokes toward his elbow. His fingers are placed slightly higher on the shaft of the pen than those of the right-hander. INDEX has five levels of exemplars for beginners through older students, BEGIN and LEVELS 1-4. Click the image for a sample. BEGIN has pictures to trace and color that help with rhythm, direction and paper placement. Other sections include lowercase and capital letters, numerals and guideline pages. Please see the sample page from the capital section where you can type in any proper names. LEVEL 1 has lowercase letters, capitals and additional exemplars for practice that include numerals. LEVEL 2 has lowercase letters that join, capitals and numerals. The guidelines are a bit narrower for characters that are smaller. Here is a sample page that you can edit. LEVEL 3 has handwriting review in a vertical format with smaller characters. LEVEL 4 has a wide variety of pages to stimulate the older writer's interest in practice. 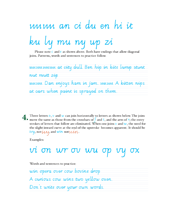 Guidelines are spaced for letters that approximate the average size of adult writing. CONCEPT groups exemplars according to concepts that the user feels need extra instruction. These include lessons on RHYTHM, POSTURE, DIRECTION, LOWERCASE, CAPITALS, NUMERALS and ON YOUR OWN. MY PAGES provides a space where you can store exemplars that you want to use again.